A power-lifting ‘Nam vet with daddy issues and a messianic complex hunts down women in downtown Los Angeles. That’s pretty much it for Don’t Answer the Phone!, unique (if you wanna call it that) in that the antagonist has daddy rather than mommy issues. According to Julian Petley, author of Film and Video Censorship in Modern Britain, the flick was released with an X-rating there, in response to a warning from an English chief justice regarding “positive incentives” to commit imitative crimes from movie scenes. Thus, Don’t Answer the Phone! got labelled with the often arbitrary “video nasty” tag and had minutes snipped from its run-time. Other nasties got more notoriety and as such, Don’t Answer the Phone! is a bit below the radar as far as 80s slashers are concerned. 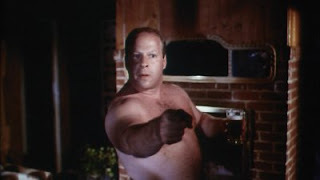 However it achieved some prominence for the wonderfully wacky performance of Nicholas Worth as the killer, bringing a burly, Michael Chiklis physicality to the role as the weepy, drug-addled, pumping iron-obsessed killer. Why shouldn’t you do what the poster says? That’s a good question, because phones don’t really figure prominently in the killer’s MO. Sure, he is a regular caller to a local therapist’s talk radio phone-in show, where he describes his recurring headaches in a mock Mexican accent as “Ramon.” And he also picks up a prostitute and asks her to call the Dr Lindsay Gale Show before throttling her in a derelict motel. Still, the point stands: answering or not answering a phone is hardly of any import here. If anything, you should not answer the door or accept the killer’s business cards. He’s an amateur photographer, and his ruse is to sweet talk starlets and ideally get them back to his apartment for a photo shoot before dispatching them with a stocking and a (lucky?) coin slipped inside. This entry was posted in Exploitation films and tagged 80s horror movies, horror podcast, slasher films by Really Awful Movies. Bookmark the permalink.